Through interactive lectures and world-renowned keynote presenters, this anti aging conference will include the latest clinical research and education on hormones, nutrition, and gastrointestinal treatment approaches. Touching upon the overarching themes of empowerment, self-growth, and introspective discovery, the Congress will specifically focus on the most novel techniques and technologies in personalized medicine. As we return to our root cause & mission statement—to redefine medicine, and disseminate education surrounding comprehensive, customized healthcare – we continue to purvey the most effective, preventive practices & protocols to our thousands of members, attendees, and supporters across the globe. MG Developer brings a morning full of wellness and revitalization for Wellness in the Gables every third Saturday of the month. Featuring an upbeat workout session led by renowned fitness trainer Tony Thomas followed by soothing yoga, Wellness in the Gables will create a tranquil atmosphere surrounded by Ponce Circle Park’s lush environment, encapsulating guests within the heart of the city. Wellness in the Gables is the first of MG Developer’s series of events providing open spaces with curated wellness activities focused on uplifting the body and mind. Sponsored by Lux Lifestyle Chiropractic, you can enjoy a complimentary posture/health assessment by checking body balance and weight distribution. The event will begin with a lively and invigorating workout, with a relaxing hour of yoga soon thereafter that will remove the work week’s stress and leave you ready and refreshed all day long. Taking place Saturday, April 20, Wellness in the Gables will take place from 9:30 a.m. – 11:30 a.m. at Ponce Circle Park in Coral Gables, across 2800 Ponce de Leon Boulevard. Courtesy of MG Developer, Wellness in the Gables is free and open to residents of Coral Gables. For general inquiries, please call 305-968-3734. For complimentary tickets, please register in the link provided. Full class schedule for the series may be found below. Spring into smooth skin at the Miami Center for Dermatology during their sixth annual Night of Beauty event on Thursday, May 2, 2019. Dr. Deborah Longwill and representatives from the dermatology pharmaceutical industry will showcase the latest and most effective, advanced-technology procedures, non-surgical alternatives, lasers, injectables and products for all generations of skin from newborn to mature. The event is free and open to the public.The following companies will be on hand to discuss and demo their respective treatments. In addition, Dr. Longwill be showcase her signature skin care product line, Hydrafacials, VI Peels, Lash Lifts and Tint and PDO Threads as guests enjoy cocktails, sushi and light bites. Join us on Saturday, May 11, 2019 for the Orange Bowl Fitness Weekend. Two great events, one day! Orange Bowl Fitness Weekend consists of the 2019 Windhaven Insurance Orange Bowl Paddle Championship and the 2019 AvMed Orange Bowl Walk/Run 5k. Proceeds from both events benefit Big Brothers Big Sisters of Miami. Register today! As part of Earth Day celebrations join us for a Night & Sound Bowl Meditation Experience with Adrian Molina from Warrior Flow® LLC. RSVP includes one complimentary drink at Malibu Farm! With prom season upon us, The Biltmore Hotel Spa invites teens to make the hotel their pre-prom destination with the spa’s special Prom Primping Month. Guests will enjoy our NOURISHER FACIAL for 50 Minutes and FACE-LESS FACIAL for 50 Minutes designed specifically for teenage skin. We use clean, safe, and effective products to provide a clean, clear and healthy complexion. Our treatments are suitable for all skin types, and especially beneficial before special occasions like prom! Enjoy these services at the discounted price of $99 each this month. The Biltmore Spa invites you to take part in two special sessions in honor of Sleep Awareness. The Biltmore invites guest instructor Dr. Alejandro D. Chediak of the UHealth department of Pulmonary and Sleep Medicine to answer the top 10 questions about sleep. Dr. Chediak will host his lecture “The Importance of Sleep” on Tuesday March 26 at 6:45 pm at the Prado meeting room. This lecture is open to the public without a fee. Additionally, Dr. Tanya Pergola will host a special yoga event “Nurturing a Meditation Practice” on Saturday, March 30th at 9:30 am in the hotel’s yoga studio. Here, guests can learn from the internationally acclaimed award-winning author and teacher on the benefits and techniques of cultivating a daily practice of yoga and meditation. General Admission tickets are $35 per person for the special yoga event. Fitness Members and Hotel Guests have complimentary entry. You’re invited to our first-ever #FacetheWorld event! We’ll get together for a fun-filled morning with bubbly, bites, and lots of free goodies. Come hang and meet local businesses that are ready to pamper you! We look forward to bringing the community together to celebrate health and wellness! Sage Dental is excited to announce the Grand Reopening of our Hallandale Beach office! Come out and enjoy FREE Advanced Oral Cancer screenings, meet and greet with the dentist and team, raffle prizes, food & refreshments and much more! UnitedHealthcare will host A Better You, a series of health and wellness educational events, on April 6 to help seniors and other Medicare beneficiaries learn more about Medicare and their health care coverage options. • 82-year-old record-breaking bodybuilder, Ernestine Shepherd partners with A Better You to encourage people to seek optimal physical and mental health at all ages by sharing her personal story. • Local leader Rev. Arthur Jackson lll of Antioch Missionary Baptist Church will be sharing a word on inspirational guidance. • Rita Tolbert from UnitedHealthcare will walk attendees through the basics of Medicare – including the different parts of the program, eligibility requirements and enrollment windows – to help them make informed health care coverage decisions. • Attendees will also enjoy the live music and high-energy performance of legendary vocal group The Persuasions. Events will be held on Saturday, April 6, at 10 a.m. and at 2:30 p.m. at the Miramar Cultural Center, 2400 Civic Center Pl Miramar, FL 33025. The events are open to the public, and there is no cost to attend. For more information or to RSVP, call 1.888.385.1995 or visit www.abetteryou.info. Take Steps for Crohn’s & Colitis at the 2019 Miami Walk & help find a cure! The Take Steps Miami Walk is a festival style event for the community. It’s a day for the IBD community to come together to EMPOWER, INSPIRE, & CONNECT with each other and to solidify the fact that NO ONE is ever alone in this fight. Make your impact & register today! We will have food, drinks, music, & much more! Bring your famliy & friends too! MG Developer brings a morning full of wellness and revitalization for its first ever Wellness in the Gables. Featuring an upbeat workout session led by renowned fitness trainer Tony Thomas, followed by soothing yoga led by Susana Freire. Wellness in the Gables will create a tranquil atmosphere surrounded by Ponce Circle Park’s lush environment, encapsulating guests within the heart of the city. Wellness in the Gables is the first of MG Developer’s series of events providing open spaces with curated wellness activities focused on uplifting the body and mind. The event will begin with a lively and invigorating workout, with a relaxing hour of yoga soon thereafter that will remove the work week’s stress and leave you ready and refreshed all day long. Taking place Saturday, March 16, Wellness in the Gables will take place from 9:30 a.m. – 11:30 a.m. at Ponce Circle Park in Coral Gables, across 2800 Ponce de Leon Boulevard. Courtesy of MG Developer, Wellness in the Gables is free and open to residents of Coral Gables. For general inquiries, please call 305-968-3734. The inaugural event will begin with a lively and invigorating workout, with a relaxing hour of yoga soon thereafter that will remove the work week’s stress and leave you ready and refreshed all day long. Starting Saturday, February 16, Wellness in the Gables will take place from 9:30 a.m. – 11:30 a.m. at Ponce Circle Park in Coral Gables, across 2800 Ponce de Leon Boulevard. Courtesy of MG Developer, Wellness in the Gables is free and open to residents of Coral Gables. For general inquiries, please call 305-968-3734. The Healthy Start Coalition of Miami-Dade will host its Annual Awards and Recognition Luncheon on Friday, March 1, 2019 from 11:00 a.m. to 2:00 p.m. at the Hilton Miami Airport. The Awards and Recognition Ceremony celebrates the invaluable work Healthy Start Coalition of Miami-Dade does as leaders in maternal, infant and child health in Miami-Dade County. NBC 6 Meteorologist Adam Berg will serve as the Master of Ceremonies for this year’s ceremony. Healthy Start Coalition of Miami-Dade will recognize its staff, board members, contracted providers, vendors, volunteers and professional colleagues for their tireless commitment in ensuring every baby in our community has a Healthy Start in life. W Fort Lauderdale invites you to turn up the heat with a ‘Pump Your Ride’ combo-workout. Fuel your morning with a 30-minute spin class outdoors and overlooking the ocean with Jason Norton and Nikki Reifschneiider of Fort Lauderdale’s local Ride Element studio, followed by a 30-minute #PumpedAF Pumpfit cardio workout with @HannahEden_Fitness and Paulo Barreto. Arrive at 9AM to get first dibs and refresh with organic juices from Unleash Life, smoothie sips from Dr. Juice, and fresh bites. After a successful workout sesh, workout the kinks with a Quick Fix massage from the hotel’s new AWAY spa, and stay and play with an all day WET Deck day pass. Tickets cost $35 and include complimentary valet parking. Thousands of walkers and runners will make strides in the ongoing fight against drunk driving during the 9th Annual Ultimate Software presents the La Croix & Lennox National Account Services Walk Like MADD & MADD Dash Fort Lauderdale 5k brought to you by UBS on Sunday, April 28. This event is MADD Broward County’s annual signature fundraising event in support of its mission to end drunk driving. It takes place in over 90 cities in the U.S., including Fort Lauderdale. The day’s festivities will also include children’s activities, an awards ceremony, live musical performances and vendor/educational booths. The event will be attended by local dignitaries including Founder and Volunteer Chairperson Heather Geronemus, event co-chair Rachel Perz, and honorary chairs Matthew ‘Whiz’ Buckley and Major Robert Chandler. Since it was established in 2011, this event has raised over $1.75 million that stays in our community to save lives and support victims of drunk driving. All event proceeds benefit MADD Broward & Palm Beach’s community education, victim support services and youth programs. Events sponsors include Signature Sponsor Ultimate Software; Title Sponsors La Croix Water and Lennox National Accounts; Presenting Sponsor UBS; State Safety Champion Sponsor Alert Today Florida; Road Guardian Sponsors Aetna, Broward Sheriff’s Foundation, Broward Sheriff’s Advisory Council; Corporate Champion Sponsors Brandsmart USA, Greenspoon Marder, Office Depot and Path Medical. To register for the 9th Annual Ultimate Software presents the La Croix & Lennox National Account Services Walk Like MADD & MADD Dash Fort Lauderdale 5K brought to you by UBS, visit www.walklikemadd.org/fortlauderdale. Event sponsorships are available. Awards will be given for top fundraiser, top team (private and corporate), as well as overall and age-group awards for 5K finishers. For the most up-to-date event information, visit www.facebook.com/MADDDashFortLaud. Participants can sign up as an adult or youth virtual walker if they cannot attend the event in person but still wish to fundraise. Cost: $42. No registrations accepted after March 6. The 2019 Mercedes-Benz Corporate Run presented by Turkish Airlines, a three-circuit 5K (3.1 mile) run/walk, will once again wind its way through the streets of Downtown Fort Lauderdale. Known as “Florida’s Largest Office Party”, the run is open to employees of businesses, corporations, government agencies, financial institutions and non-profits – regardless of company size – and incorporates a special competition to award the overall men’s, women’s and co-ed teams in 20 different industries. Beginners can “ease into exercise” with friends, gain inspiration and motivation to continue walking and running to improve overall health, while competitive runners have the opportunity to shine amongst their co-workers and lead the corporate team to victory. As part of the tri-county race circuit, $1 per participant of the Fort Lauderdale run will benefit United Way. The 2019 Mercedes-Benz Corporate Run presented by Turkish Airlines, a three-circuit 5K (3.1 mile) run/walk, will once again wind its way through the streets of Downtown Miami. Known as “Florida’s Largest Office Party”, the run is open to employees of businesses, corporations, government agencies, financial institutions and non-profits – regardless of company size – and incorporates a special competition to award the overall men’s, women’s and co-ed teams in 20 different industries. Beginners can “ease into exercise” with friends and gain inspiration and motivation to continue walking and running to improve overall health, while competitive runners have the opportunity to shine amongst their co-workers and lead the corporate team to victory. As part of the tri-county race circuit, $1 per participant of the Miami run will benefit United Way. Hilton Fort Lauderdale Beach Resort invites you to a playful yoga and movement class customized for families with kids of all ages! Parents and children will be inspired to move, pose and share an “om” with a certified instructor from Little Buddhas Yoga, all while enjoying ocean breezes on their open-air oceanfront venue, BalQony. This health and wellness event encourages families of all ages to flow together both on and off their mats! Attendees will receive an hour yoga session followed by wellness offerings. Something about doing Sunset Salutations that connects the soul positively to the Universe. With the balance of MIND and SPIRIT awareness; adding the healing of the BODY with a healthy smoothie from Tasty Smoothies is only right. Herbal Teas served before the session for relaxation. Yoga session begins EXACTLY at Sunset, approximately 5:43pm. Smoothies served after. Starting January 27, 2019 and every Sunday thereafter. Following a fun-filled workout at Daybreaker, make your way to Faena Bazaar for an afternoon of rejuvenation and relaxation. In the open-air courtyard, sample more than 35 varieties of Chinese herbal elixirs from Soul Tavern as you browse a colorful collection of fashions and accessories by emerging designer, C. Bonz, who will customize your purchase with a complimentary embroidery. Upstairs at the Goldish Oasis rooftop lounge, join us for a traditional gongfu tea ceremony. Sip on a rich Taiwanese oolong tea, or try the Chinese green jasmine tea from Mengding Mountain. Revitalize with a healing sound bath under the crystal garden, soak in ocean views and complete your day with live jazz-inspired performances by local musicians in the glow of 2019’s first full moon. Event is complimentary and open to the public. Courtyard pop-ups from 11 am to 4 pm. Tea ceremony rotates every 15 min. from 2 pm-sundown. Sound baths all day in 10-min. sessions from 11 am. Music & dancing from sundown to close. For more information, please call + 1 786 490 2003. An integral part of all classical schools of yoga is their lineage, or a tracing of their roots from teacher to teacher to teacher. Yoga has been rebranded, restructured to fit modern society but the potency of these practices lie in whats taught in the texts. Michelle Berlin will lead a workshop that gives a brief history and background of classical hatha yoga, incorporating the breathe work , kriya , & nada yoga. The class will include movement that will help cultivate a meditative mind. Nada yoga is the “union through sound ” the inner transformation using sound vibrations. Traditionally mantra was used but in the experience students will explore their inner world with mantra as well as singing bowls & the hand pan drum. Mark your calendars for Sunday, January 20 as Daybreaker returns to Faena Forum for “Dance Dance Resolution”, an exhilarating day of holistic wellness with dancing, yoga practice, meditation, sound healing and more in partnership with Tierra Santa Healing House. Start your morning with intention and flow as Tierra Santa’s Spa Director, Agustina Caminos, leads an hour-long yoga session. If a fast-paced, high-energy workout is more your style, join choreographer Skyler Rodgers for his signature Skybeat Dance Fitness class. Then, cool down with Agustina Caminos and James Casablanca of Tierra Santa Healing House as they guide a Twin Hearts Meditation designed to activate the chakras and calm the mind. Afterwards, experience the therapeutic benefits of sound healing as Dennis Hunter of Warrior Flow leads an invigorating sound bath. For an epic end to the day, bring your New Year’s resolution to the dance floor at Faena Forum’s rose marble Amphitheater and groove to live sets by Miami-based DJ, Dude Skywalker. Attendees will receive an hour yoga session followed by refreshments and wellness offerings. Each adult purchases a $20 ticket, which will also include children. Please bring your own yoga mats. Fitness buffs looking to pick up the pace while also mingling with the locals can join Surfside’s first ever Boot Camp n Brews event, which will be held January 17 and February 7, 2019, from 6 to 9 p.m. The event will combine an energizing, heart-pumping, one-hour boot camp, followed by a rewarding craft beer tasting at the Grand Beach Hotel Surfside. Amidst the hustle and bustle of Miami Art Week, take a moment for self-care and achieve a heightened state of tranquility through Twin Hearts Meditations at Tierra Santa Healing House. From December 6-8, Spa Director Agustina Caminos will guide these complimentary experiences, utilizing energy manipulation techniques developed by Master Choa Kok Sui, the founder of pranic healing, to promote the expansion of positive energy into your physical and emotional wellbeing. Participants of all fitness levels are invited to revel in a moment of stillness, release negative emotions and open their hearts to new experiences. Meditations are complimentary and open to the public. Space is limited, and reservations are strongly encouraged. To RSVP and learn more, call +1 786 655 5700 or email Tierra Santa at spamiami@faena.com. Co-Founder of Miami Beach’s prestigious Miami Life Center, Feldmann will lead this intimate experience on Pao’s ocean view terrace. Complimentary and open to the public. Space is limited and pre-registration required. To RSVP and learn more, call +1 786 655 5700 or email Tierra Santa at spamiami@faena.com. Hilton Fort Lauderdale Beach Resort is once again hosting its monthly fitness event, Balance on BalQony. This month will celebrate the holidays with a festive twist! Attendees are encouraged to wear their workout-ready ugly Christmas sweater and Santa hats. Taking place on the resort’s open-air oceanfront venue, BalQony, the event will offer attendees an hour workout by RoxFire Fitness, who will be teaching a CrossFit training session followed by a relaxing yoga and meditation session by Return to Life. Light bites and refreshments will be provided by Dr. Juice Health, Vegan Fine Foods, Catered Fit and BABE rosé. Tickets are $20 per person and include: the workout session; food and beverage; and resort valet. Mental health issues are top of mind for our businesses and community. How do we keep our companies running while responsibly handling conditions such as widespread workplace stress, trauma recovery, post-partum depression, chronic anxiety, and other conditions? Presented by the Greater Miami Chamber of Commerce, the “Why Mental Health Must Matter for Your Business Health” function will feature speakers such as Manny Fermin, CEO of the Healthy Start Coalition of Miami-Dade. Panelists will discuss topics relating to maintaining a mentally healthy working environment. 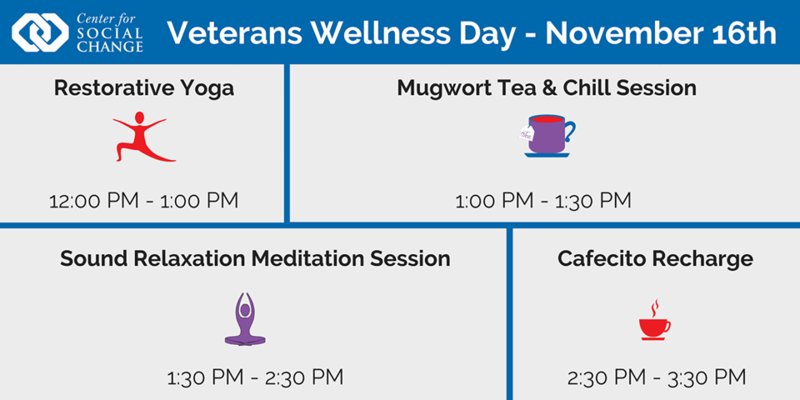 In honor of Veterans Day, The Center for Social Change is offering a series of wellness events for FREE for veterans and their families, or by donation for anyone else who is interested in joining. Participants do not need to be members of the coworking space. All proceeds will go to a veteran organization. We’ve curated an afternoon of events designed to destress and chill. Settle into your Sound Healing Meditation seat with a warm cup of mugwort tea. Mugwort is an herb traditionally used to relax the body, clear the mind, and allow one to maintain a meditative state while lying in a sleeping position. Find a yoga mat, snuggle up with some blankets, and enjoy the soothing sounds of crystal bowls, chimes, tuning forks, and bamboo flute music played by experienced mindfulness and meditation teachers. What? It’s Miami! Catch up with friends and family while getting your afternoon buzz with fresh cuban coffee and light snacks. Center for Social Change is located on the corner of Coral Way and SW 21st Avenue in the offices above Xixon restaurant, on the second floor. If you’re traveling by car: The Center has free parking (only for this event) on Floor 2B of the parking garage attached to 2103 Coral Way. If these spots are full, metered spaces are available of Floor 2A. Cash, Park Jockey, and Pay-by-Phone are all accepted. Floor 2A is the accessible floor and has disabled permit parking. Electric vehicle recharging stations are also available. Image and Audio Consent and Release: If you do not wish to be photographed or recorded, please inform Center staff upon arrival at the venue and we’ll accommodate your request. In order to find balance in your life, you must clear your mind of distractions to establish a stable foundation to support you in achieving your dreams. Surrender and do nothing while letting gravity release your tension with a 2-hour deep stretch meditation session. Christine will guide the group in restorative floor postures and guided meditation that will leave your mind blank and your limbs limber. Each stretch is designed to alleviate existing joint and muscle pain while increasing flexibility to prevent new injuries. This workshop is open to all levels regardless of physical limitations, joint replacements or disabilities. The only requirements are a desire to alleviate discomfort and the willingness to relax your mind.